Dry cleaners, key cutters, and shoe repairers on the High Street. It opened in November or early December 2014. The premises were previously occupied by Carbon bar/restaurant photo. Later it was a taco takeaway called Tacolisa photo (all halal according to a message on their Twitter account in April 2012). However, as of April 2014, the premises at number 90 were closed up with newspaper pasted over the windows, and Tacolisa was in the process of moving next door to number 92 and rebranding to The Goodness. Tacolisa was last confirmed at number 90 in October 2013. Number 92 remained vacant until at least August 2014. 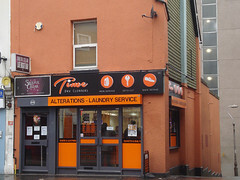 By November 2014 there were signs it was about to open as a dry cleaners called Time photo. Last edited 2018-12-24 16:23:34 (version 38; diff). List all versions. Page last edited 2018-12-24 16:23:34 (version 38).